Your home’s gutter is an integral element of stormwater management – They are responsible for diverting rainwater and other precipitation off your roof and away from the home. Improper gutter installation or lack of maintenance and repair can cause detrimental consequences on your residence such as structural damage, damp interior walls or leaking and even mold growth. At Top Dog Home Pro, we’re the leading source of 5” and 6” Seamless Aluminum Gutters in Northern Virginia. Gutter installation: Our experts install seamless gutters that fit perfectly into your home’s composition. By choosing Top Dog Home Pro, rest assured that your new gutter installation will be an excellent investment in your home, resulting in increased protection and value. Gutter maintenance & repair: Even if you’re unsure if your gutter needs repair, it’s a good idea to have an expert come and take a look. Should your gutter need to be fixed, we ensure repairs will be completed in a professional, timely manner. This may include: caulking or sealing, tightening existing gutter, testing gutter slope, testing drainage, inspection of the roof, and more. Gutter replacement: Don’t let an old, broken gutter go unchecked. We will replace it with a new, modern one that provides the superior protection your home deserves. What is a gutter guard, and why should I install it? Keeping gutters clean and free of leaves, sticks or other debris is an excellent low-maintenance method to protect your home and gutter system. 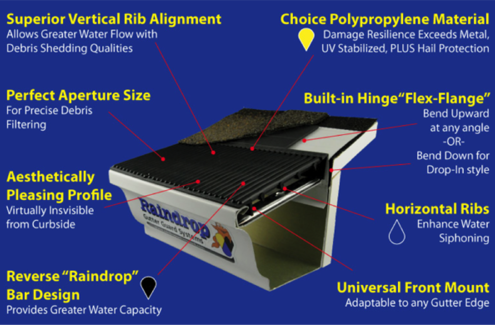 We’ve teamed up with Raindrop® to deliver gutter protection like no other. The Raindrop® gutter guard fits on every home, roof style and gutter system and is essential in providing a maintenance free & self-cleaning gutter protection system. What makes Raindrop® Gutter Guard stand out from the rest is the system’s capacity to handle any amount of water – from a spring mist to a torrential downpour. Made from a special blend of polypropylene and UV stabilizers, these guards can withstand the harshest storms, hottest climates and coldest seasons with ease. In addition, they are virtually invisible and the black color can help to absorb heat from the sun to control ice in the winter season. WHY CHOOSE TOP DOG HOME PRO FOR YOUR NEXT GUTTER PROJECT? 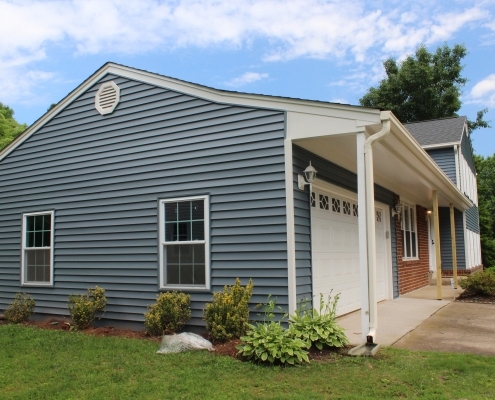 We’re the leading source of 5” and 6” gutters in Northern Virginia, delivering unparalleled quality and performance for each and every installation. Quality made certain, satisfaction guaranteed – that’s our promise to you. For more information about our residential gutter services, please don’t hesitate to contact us today for a free quote.